Pull out your mobile phone and text VALPAK to 727272 to get a FREE Redbox Rental code sent to your phone! Not familiar with Redbox? You can pick from a wide array of newly released Blu-ray’s, DVD’s and video games at Redbox kiosks. They are red movie rental kiosks typically located in front of grocery and convenience stores! Find a Redbox location! This code is valid until February 28th 2019. Free Redbox DVD Rental Code!! Pull out your mobile phone and text RENTURN to 727272 to get a FREE Redbox DVD Rental code sent to your phone! Not familiar with Redbox? You can pick from a wide array of newly released Blu-ray’s, DVD’s and video games at Redbox kiosks. They are red movie rental kiosks typically located in front of grocery and convenience stores! Find a Redbox location! Pull out your mobile phone and text GAMENIGHT to 727272 to get a FREE Redbox DVD, Blu-Ray or Game Rental code sent to your phone! Not familiar with Redbox? You can pick from a wide array of newly released Blu-ray’s, DVD’s and video games at Redbox kiosks. They are red movie rental kiosks typically located in front of grocery and convenience stores! Find a Redbox location! Complimentary Google Play Movie Rental!! 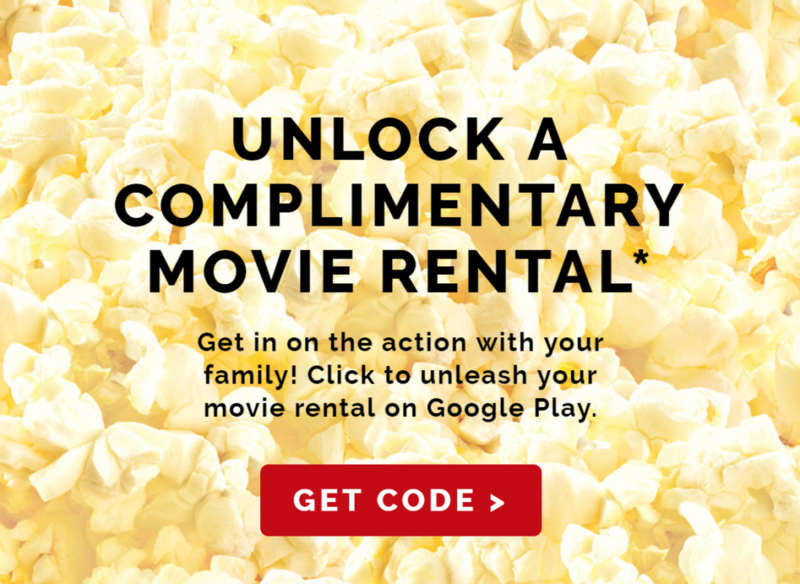 Click on the button that says Get Code and follow the prompts to unlock a free Google Play movie rental complements of Orville Redenbacher’s. Pull out your mobile phone and text HEB to 727272 to get a FREE Redbox DVD Rental code sent to your phone! Your unique code will be valid until 9/16/15. Not familiar with Redbox? You can pick from a wide array of newly released Blu-ray’s, DVD’s and video games at Redbox kiosks. They are red movie rental kiosks typically located in front of grocery and convenience stores! Find a Redbox location! Pull out your mobile phone and text MOVIENIGHT to 727272 to get a FREE Redbox DVD Rental code sent to your phone! Not familiar with Redbox? You can pick from a wide array of newly released Blu-ray’s, DVD’s and video games at Redbox kiosks. They are red movie rental kiosks typically located in front of grocery and convenience stores! Find a Redbox location! Pull out your mobile phone and text SURPRISE to 727272 to get a FREE Redbox DVD Rental text to your phone on 5/18/15! Not familiar with Redbox? You can pick from a wide array of newly released Blu-ray’s, DVD’s and video games at Redbox kiosks. They are red movie rental kiosks typically located in front of grocery and convenience stores! Find a Redbox location! Free Redbox Video Game Rental!! Pull out your mobile phone and text FREEPLAY to 727272 to get a FREE Redbox Video Game Rental! Not familiar with Redbox? You can pick from a wide array of newly released Blu-ray’s, DVD’s and video games at Redbox kiosks. They are red movie rental kiosks typically located in front of grocery and convenience stores! Find a Redbox location!